Apple Computer announces the resignation of Gil Amelio as CEO. 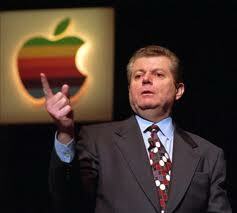 Having been ousted by the board of directors, Amelio’s departure paved the way for Steve Jobs to re-take the helm of Apple. Ironically, it was Amelio who brought Jobs back into the fold of Apple by purchasing Jobs’ company NeXT to use as the basis for the next Mac operating system.